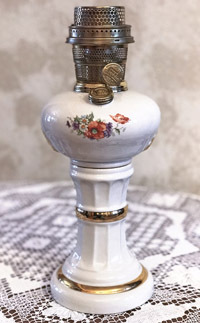 The Victoria is unique in being the only Aladdin kerosene lamp style to be made of porcelain china. 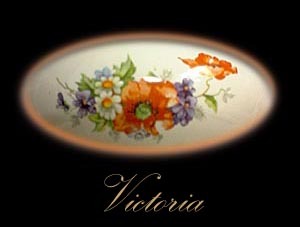 The flowers on the Victoria are a decal, and may be found in two variations. Many collectors think that Aladdin just used two different decals, and that the Victoria lamp itself is the same no matter what decal adorns it. I thought that myself until I had the opportunity to set the two lamps side by side. When I did however, it was quite apparent that the two lamps really are completely different Victoria lamps. Actually there are three different Victoria lamps. You will see two of them in this section. The third Victoria was a single unique example that was found. 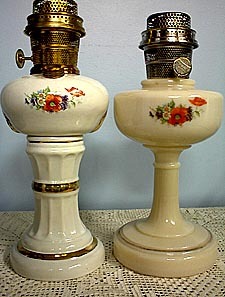 It was a lamp with smaller dimensions, like one of those shown here, except it did not have an oil fill molded into the bowl of the lamp. I have seen this lamp, and so far it is the only one to be found that does not have an oil fill. The Simplicity Decalcomania (also called Decalmania) on the right, and the Victoria shown on the left, share the same decal. The Victoria and Decalcomania also have the same style of gold band on their base. Sadly the gold bands on both share the tendency to wear through from handling. One of the first things that collectors check on these lamps is the degree of ware on the gold highlights. While all the Simplicities have the same decal, the Victoria has two decals that vary slightly in appearance. One decal has smaller flowers with a poppy flower on the upper right of the decal, while the other has larger flowers without the poppy flower on the upper right edge of the decal. However what people probably aren't aware of, is that the lamps have different decals because they really are different Victoria lamps. When you click on the B-25 link below, look at the two lamps closely. They were made from two completely different molds. Look closely at the stem of the lamp where it flares outward just below the bowl on both lamps. This is where you most readily notice that the designs are different. It will take you a little longer perhaps to realize that the dimensions of these two lamps are completely different. One is larger than the other. Such things are hard to identify unless you have the two lamps setting side by side, but they become readily apparent when they are. One of the Victoria lamps is definitely slimmer in its dimensions than the other, supporting the fact that two different Victoria lamps were manufactured. The third, without the oil fill, may have been a prototype since there have been no other examples found.